150,000. That is how many people are impacted by food insecurity in the Triad alone. Food insecurity is determined based on the accessibility a community has to fresh, healthy food. To put the astonishing total of 150,000 people into perspective, Wake Forest’s BB&T football field could be filled almost five times with families in our community struggling to feed their families each and every day. Factors such as low-income and low-educational attainment are correlated with drastically lower life expectancy differences compared to those residing in high-income and high-educational attainment areas. The statistics are alarming, but rest assured that community organizations across the Triad are working together to move the needle on this issue. The Hampton Family Mobile Kitchen is just one way the American Heart Association is helping to combat food insecurity in our community. 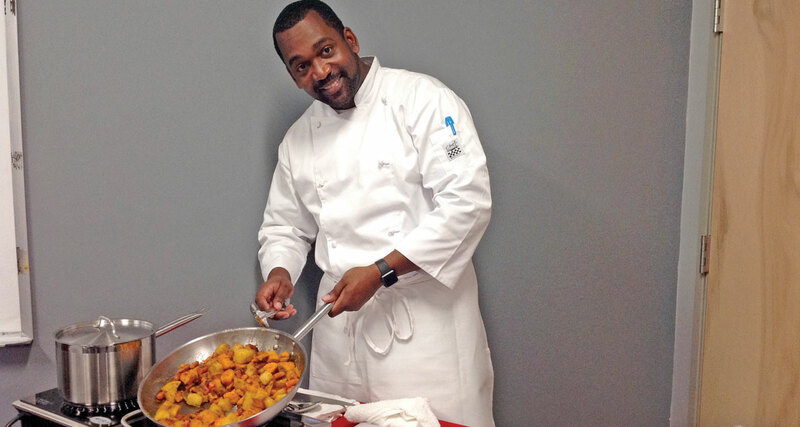 Made possible by the generous funds from The Blairton Hampton Family and Mount Zion Baptist Church, these healthy cooking and eating classes instructed by Chef N’gai Dickerson are focused on helping families in underserved neighborhoods in Guilford County. These classes have reached over 10,000 families! Chef N’gai’s classes are now expanding into Forsyth County to reach even more underserved communities. Do you think the idea of eating healthy and eating cheap is a paradox? If so, we are here to prove you wrong! Not quite superfoods, but people should definitely choose “whole” foods. You want to go with whole foods when shopping and planning your meals. When he refers to ‘whole foods,’ he means shopping for foods by building around vegetables. Vegetables are generally a very filling category of food, so if you build around vegetables, it is likely that you will feel more satisfied, all while your body is obtaining the most nutrition. If you are shopping for nutritious, wholesome, and quality foods, you will not have to shop for as much food because you won’t have the urge to eat every 3-4 hours. It really comes down to the idea of quality over quantity. BUT CHEF, AREN’T FRESH VEGGIES MORE EXPENSIVE? Not necessarily. There are vegetables on the less expensive side, such as potatoes that can offer that same satisfied feeling. Now that is a one-two punch for nutrition and fullness! DO I REALLY HAVE TO GIVE UP MY FAVORITES? Don’t worry! You can still offer your family the same meal that they love but with heart-healthy substitutions. Here’s a bit of advice that we could all use when it comes to being stuck in our ways: Get away from the names and look at the ingredients. I believe that having your own twist on something can really make it yours. Spaghetti is just one example! It is a very simple meal, but you can do things like make your own tomato sauce, find a chickpea or brown rice pasta and use leaner meats. IS IT TOO COMPLICATED TO LEARN HOW TO REALLY EAT HEALTHY? Not at all – the first part is to try something different! Just finding ways to break out of habits is a big part of increasing nutritional intake. Take the initiative to become more conscious about what is in your food. That is a monumental step when it comes to getting the most bang for your buck. TIME – WHAT ANSWERS DO YOU HAVE FOR THAT ONE? A factor almost as significant as money is time. Whether you are a college student or a working parent, time is of the essence. We put food on the end of the day when it should be the first thing we are thinking about. How are you going to fuel yourselves throughout the day? When it comes down to it, our bodies function by and depend on the nutrition we provide it with. What gas are you putting in your tank to fuel your engine? If cooking is not your strength, or cooking healthy sounds way too intimidating, you can sign up for one of N’gai’s classes. Guaranteed to have fun, learn something new and leave with the knowledge, healthy recipes, and a meal to try at home without putting any of your family budget at risk. For a list of Chef N’gai’s Hampton Family Mobile Kitchen classes, email Ngai.dickerson@heart.org or call 336-905-3348.